Dizziness and nausea are symptoms that often appear together. Most of the time, they are not indicative of a serious health problem and will pass within a few minutes. Sometimes, however, dizziness and nausea can persist longer than you may like, or you may find yourself more prone to experiencing these discomforting sensations. The good news is that many home remedies exist to help manage these symptoms, allowing you to find relief easily. These forms of dizziness are not necessarily unique to each other. Getting off a roller coaster, for instance, may leave you with vertigo and disequilibrium for a short time. Dizziness itself is not normally hazardous, but can lead to accidents or falls if you aren’t careful. It is best to avoid driving, operating heavy machinery, or using ladders if you feel dizzy. Why Is Dizziness Paired With Nausea? Nausea typically accompanies dizziness. The reason for this frequent pairing is not fully understood, but it is believed to be the result of sensory conflict. Generally speaking, the brain understands your position from the visual information it receives from the eyes and the alignment information it receives from the inner ear (i.e. balance and equilibrium). The part of the brain that resolves conflicts between these two is the same part that can force you to vomit. The theory is that when there is a vision/balance conflict, the brain assumes it has been poisoned and attempts to purge the body of the offender. Benign paroxysmal positional vertigo (BPPV): This is a fancy way of saying “sudden movement” and is responsible for about 20% of all dizziness incidents. BPPV happens when the head undergoes a sudden shift in position, like when you bend over or roll out of bed quickly. BPPV is more common in adults and can be a recurrent problem. Low blood pressure: A drop in blood pressure can reduce oxygen to the brain and result in lightheadedness. Dehydration, alcohol, pregnancy, heat exhaustion, anemia, and some medications can cause this. Hyperventilation: Breathing too fast, such as during a panic attack or even when playing a wind instrument, can provoke dizziness. Ear infection: Infections of the inner ear disrupt your sense of balance and can lead to dizziness and nausea. Food poisoning: As mentioned, the nausea from dizziness is theorized to come from the brain’s belief that you have been poisoned. 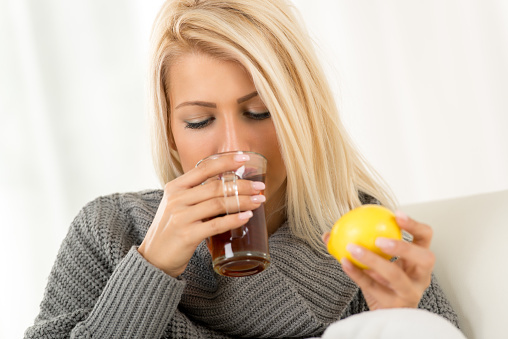 Actual poisoning, such as from bacteria or toxins you ingest, can easily provoke the symptom combo. Diabetes: Low blood sugar (hypoglycemia) is known to cause dizziness and nausea. Meniere’s disease: A condition where excess fluid builds up in the inner ear. This can result in episodes of vertigo that last for several hours or temporary hearing loss. Neurological conditions: Disorders such as Parkinson’s, multiple sclerosis, and even brain tumors, can trigger dizziness and nausea. You don’t need to be severely dehydrated in order to feel dizzy. Unless you’ve recently had a glass of water, your dizziness could be a sign that you just need some fluids. Ginger helps manage dizziness and nausea, especially from motion sickness. It doesn’t matter if you chew it raw or have it as a tea instead. Squeeze half of a lemon into a glass of water and mix in two teaspoons of sugar. You’ve just created a simple remedy that can give you a quick glucose and fluid boost. Resting accomplishes two main things. First, it lets more blood flow to your brain and can help restore oxygen levels if you’re feeling lightheaded. Second, viral infections (e.g. the common cold) can sometimes make you dizzy and rest makes it easier to fight off the ailment. If you experience vertigo, keep your back propped up to avoid lying flat. When you get up, make sure to do so slowly. There is a method called canalith repositioning, or the Epley maneuver, that can be used to help resolve episodes of vertigo. It can be demonstrated by a doctor or a physical therapist. Specific exercises (called vestibular rehabilitation) exist that aim to make your system of balance less sensitive to motion. It’s best used if you have an unusual sensitivity to motion sickness or are recovering from an inner ear infection. “Dizziness,” Mayo Clinic web site, August 11, 2015; http://www.mayoclinic.org/diseases-conditions/dizziness/basics/definition/con-20023004. “Dizziness and Motion Sickness,” American Academy of Otolaryngology-Head and Neck Surgery web site, http://www.entnet.org/content/dizziness-and-motion-sickness, last accessed October 29, 2015. “Dizziness and Nausea.” MedGuidance web site, http://www.medguidance.com/thread/Dizziness-and-Nausea.html, last accessed October 29, 2015. “Dizziness: Lightheadedness and Vertigo-Home Treatment.” WebMD web site, last updated November 14, 2014; http://www.webmd.com/brain/tc/dizziness-lightheadedness-and-vertigo-home-treatment, last accessed October 29, 2015.